House Speaker John Boehner, a Republican from Ohio, has said the Republican-led House is likely to defend the Defense of Marriage Act (DOMA). 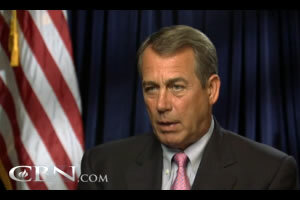 In remarks to the Christian Broadcasting Network (CBN), Boehner said he was disappointed with President Obama's decision to no longer defend the 1996 law that bans federal agencies from recognizing the legal marriages of gay and lesbian couples. And he accused the president of “pandering” to his gay and lesbian supporters. “It strikes me as something that's just as raw politics as anything I've seen, knowing that a lot of people who believe in DOMA are probably not likely to vote for him and pandering to the other side on this issue,” he said.